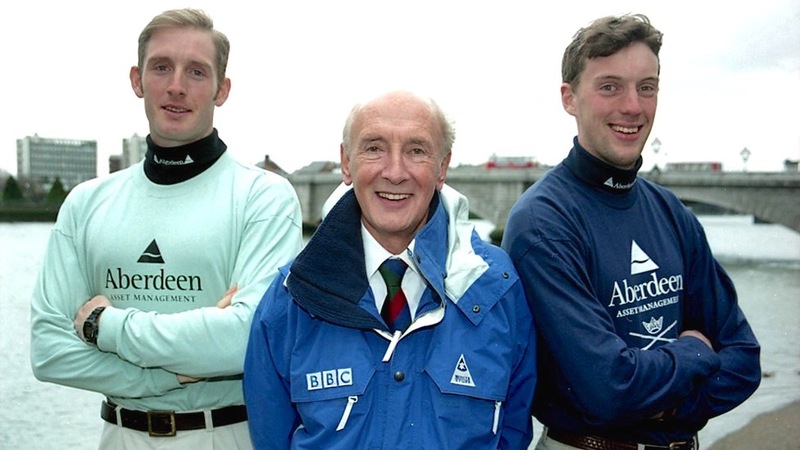 Longtime Boat Race commentator Barry Davies (centre), pictured before the 2001 Race. Picture: BBC. Chris Dodd reports from Henley-on-Thames. The River & Rowing Museum welcomed the veteran commentator Barry Davies to Henley on 30 September to join a panel of experts celebrating 80 years of televising the Boat Race. The panel included the Cambridge Blue Hannah Roberts, the BBC’s producer and behind-the-scenes mover and shaker Nick Gilbey, and the radio commentator Robert Treharne-Jones, who has backed up several well-known wireless broadcasters, including Brian Johnston who inherited the Boat Race mantle from the peerless John Snagge, and Peter Jones who followed ‘Johners’ – tragically briefly, as things turned out. 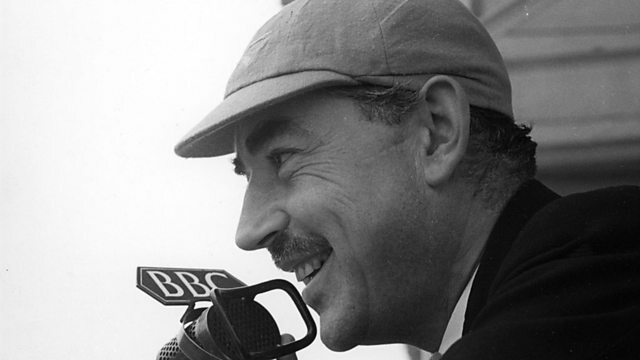 John Snagge, complete with Leander cap, the ‘Voice of the Boat Race’ between 1931 and 1980. Davies, who has just retired from football commentary, had his first impression of the Boat Race watching a black-and-white box in 1952, but his speaking role had to wait until 1993 when he took over from Gerald Sinstadt, coinciding with his son Mark – today the chairman of British Rowing – engaging with coxing at Cambridge. 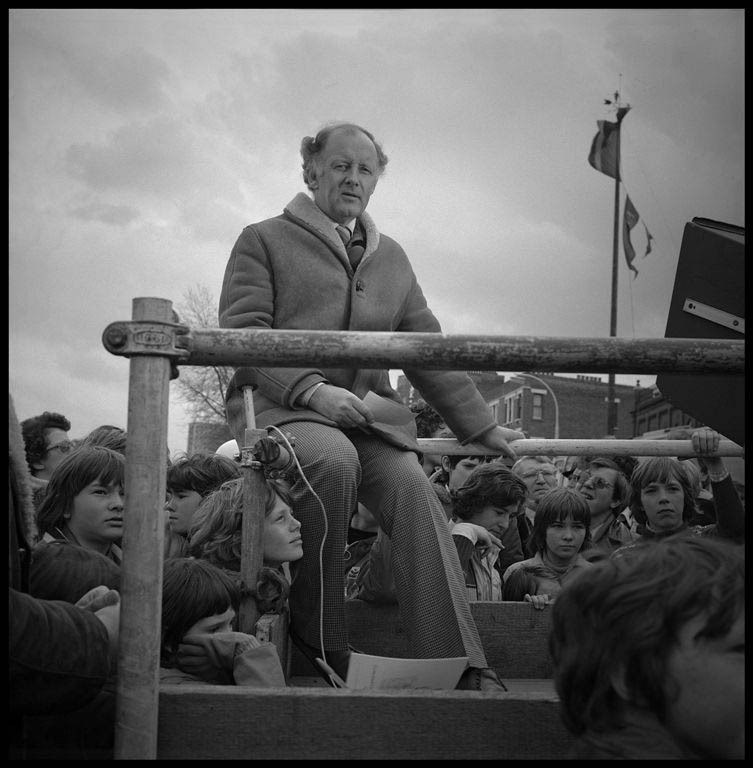 The legendary British sports commentator, Frank Bough, broadcasting from the Boat Race start sometime in the 1970s. Picture: Roger Clark. Barry proclaimed that the Boat Race is a ‘very, very special event’ and reiterated his view several times. Intense disappointment struck him when ITV captured the coverage for a few years and laid him off. When the race returned to the Beeb, Andrew Cotter took the reins, but Barry was engaged by the World Service to broadcast the battle of the Blues to hundreds of millions round the globe (and incidentally presenting the respective vice-chancellors with a ginormous free public relations bonanza). All-purpose BBC presenter, Clare Balding, interviewing CUBC’s Steve Trapmore on the morning of the 2014 Boat Race. 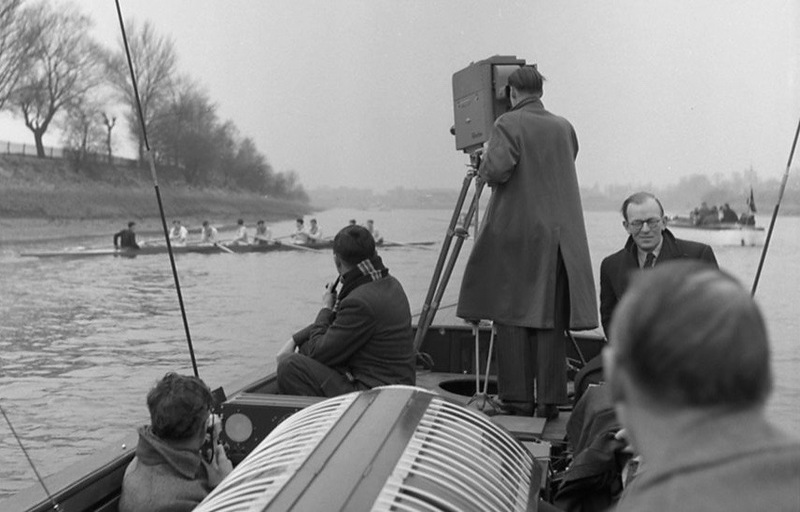 Charles Runcie, the master of ceremonies, set the scene by showing clips of race incidents that included Oxford’s dramatic sinking in 1951 and Cambridge’s in 1978, aptly demonstrating Gilbey’s assertion that the Boat Race is an example of the Beeb doing its very best by delivering exemplary treatment of a live event. Nowadays 40 cameras are engaged – cameras on rooftops and bridges, cameras clinging to launches and helicopters, cameras raised on stalks above coxswains’ heads, and ever since Oxford’s one-foot verdict of 2003, a camera on the finish line. Barry explained that the commentator does his gabbing from a trailer packed with monitors and parked on Putney Embankment, so he must rely on his collaborators, a not-so-old Blue of each colour, to spot what’s happening on the screens. Unlike the scribes and snappers aboard press launches, he doesn’t get to smell the coffee. He explained, too, that more is required to interpret the Boat Race than rocking up on the day. He would visit each crew up to half-a-dozen times during the months before the race, getting to know the coaches, presidents and the men or, these days, women. 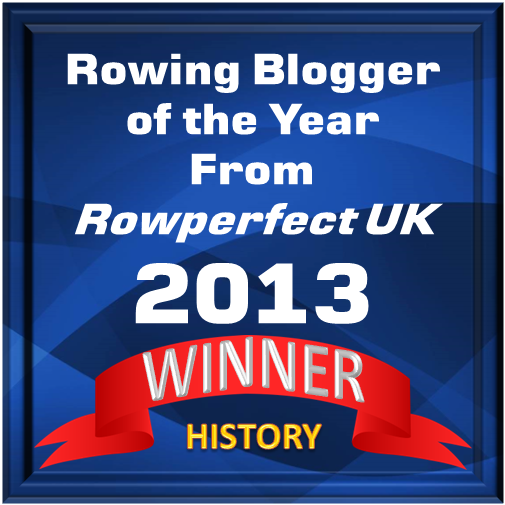 Rowing, Barry said, is without doubt the greatest team sport because of a crew’s dependence on each other. 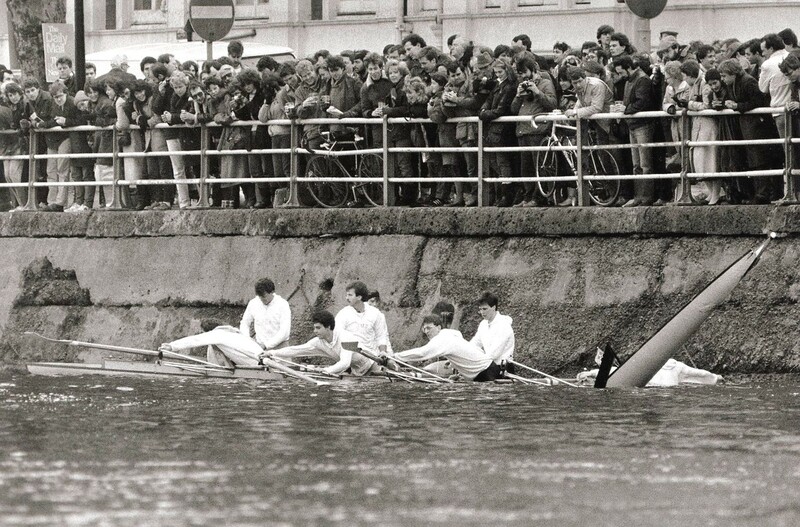 The sort of thing that most of the television audience likes to see – disaster (Cambridge indulged in some bump racing on the day before the 1984 Boat Race). But above all, the Boat Race is great fun, as well as challenging. One year, clouds were so low at the appointed hour that the helicopters couldn’t fly. The commentators were thus deprived of their revealing bird’s eye view of the Putney-to-Mortlake course. On another occasion during the ITV era, Barry was broadcasting for LBC radio from the finish line beneath a big screen showing the race as it happened. But as soon as the umpire yelled ‘Go’, the ITV director switched into commercials, and Barry had to ad-lib from thin air. Radio broadcasting from a launch in 1928. This reminded me of 1978 when Cambridge floundered under Barnes Bridge, and the hapless commentator in the Putney trailer, Jim Railton, described them as ‘going into the dolphin effect’. At the time he was talking to a screen showing Oxford stomping away through the bridge and creaming on toward Mortlake, while his spotter did not see – as we reporters in a launch could see – that Cambridge’s boat had been filling up with water from as far back as the ‘Crossing’ at Chiswick. Jim was caught by surprise, and reached for the place he wished to be, the Dolphin public house in his hometown of Wallingford. Cambridge demonstrating the previously unnamed ‘dolphin effect’ in 1978. Dr Robert T-J described the tragedy of Peter Jones, a great broadcaster who collapsed in the radio launch during his first Boat Race venture in 1990. The launch set course towards the good doctor’s car that contained his medical emergency bag while Dan Topolski, the other commentator, blustered on from what he could see on the small on-board TV monitor as the flotilla vanished round a bend. Jones was ambulanced to St George’s Hospital and died later that day. When discussion opened to the floor, a gentleman referred back to that Saturday in 1951 when Chris Davidge’s Oxford boat sank before passing the end of the Fulham Wall, and the race had to be re-rowed on the following Monday. ‘I was in that winning Cambridge crew,’ said John Worlidge, and he gave the audience a flavour of the day. 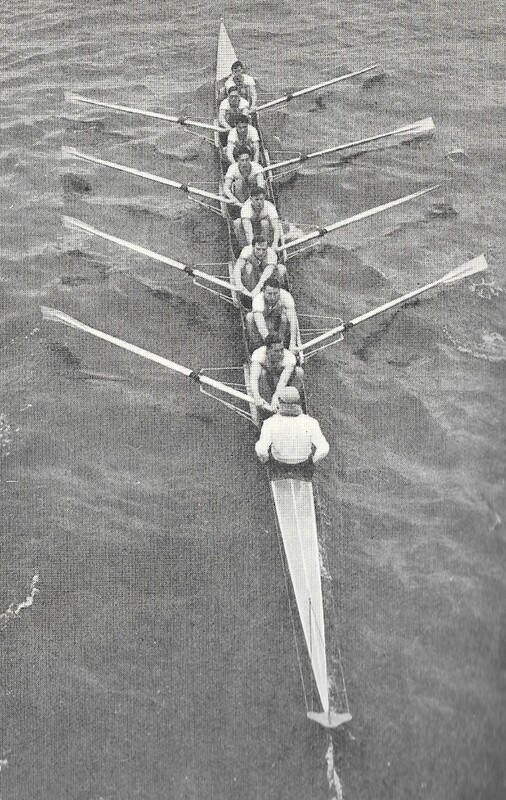 The 1951 Cambridge Crew with John Worlidge at ‘5’. 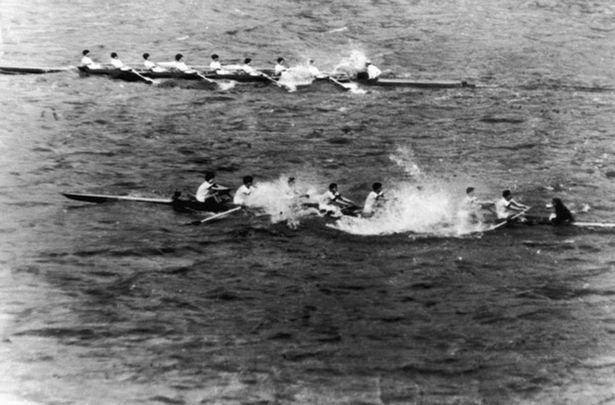 More than winning the race was at stake in 1951, because the victor’s reward was to cross the Atlantic to race Yale and Harvard. 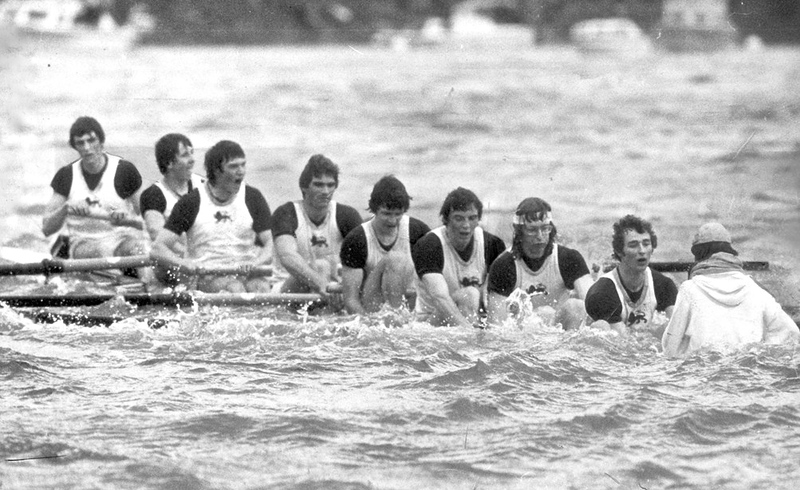 Cambridge’s tour was triumphant, beating Yale on the Housatonic River and defeating Harvard, Boston University and MIT in a four-boat race on the Charles in Boston. They were given a replica of the Paul Revere Bowl, and on their return home presented to the King and Queen during their majesties’ official visit to Cambridge University. The crew’s inclusion in the line-up came by request of the King himself. 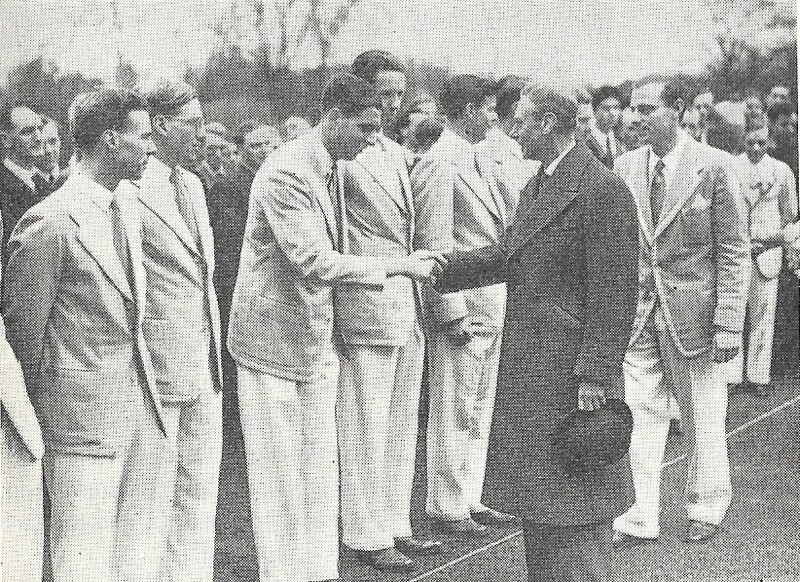 James Crowden shaking hands with King George VI at a ceremony at King’s College after the 1951 Cambridge crew came home from their successful trip to the United States. It is worth remembering that television is the youngest branch of the media to involve itself with the Boat Race. The challenge of following a race in which the whole caboodle moves over four-and-a-quarter miles has been immensely important in the evolution of news coverage. 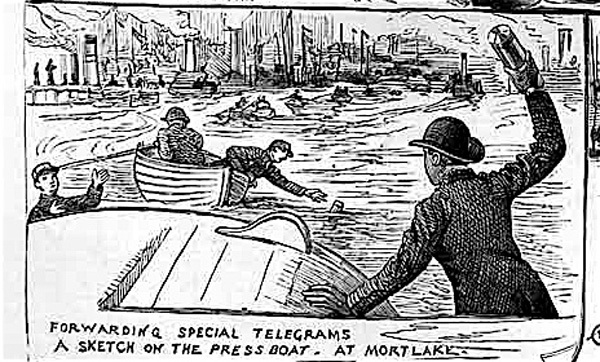 Newspapers used horseback riders to keep up, fireworks to signal the position at intermediate points and at the finish, and floating canisters into which reporters on press steamers would seal their ‘running copy’ as the race progressed and toss the canister to a boy in a boat at a pre-arranged point. The canister was rowed ashore and handed to a runner who would leg it to a telegraph office. Press reports in canisters, 1883. 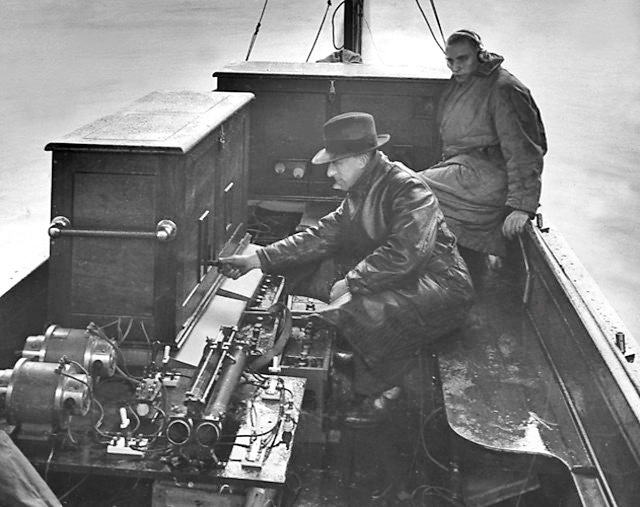 Transmission of radio signals for live broadcast from a moving boat to Alexandra Palace, where the BBC had its studios, was another Boat Race first. The ability to film from a camera on a speeding boat in turbulent water, and steadying a camera aboard a juddering airborne chopper were questions that the BBC first answered on Boat Race Day. The exhibition at the River & Rowing Museum features both equipment and those operating it that is unrecognizable compared with today’s kit. 1949 saw the first continuous live camera coverage of the race. Picture: BBC. The Boat Race – 80 Years through the Lens is showing at the River & Rowing Museum, Henley-on-Thames, until 31 December. In modern times, a semi-submersible television cameraman is always on hand to capture the fate of the winning cox. This is from 2013. Charles Runcie’s history of broadcasting the Boat Race can be found here. 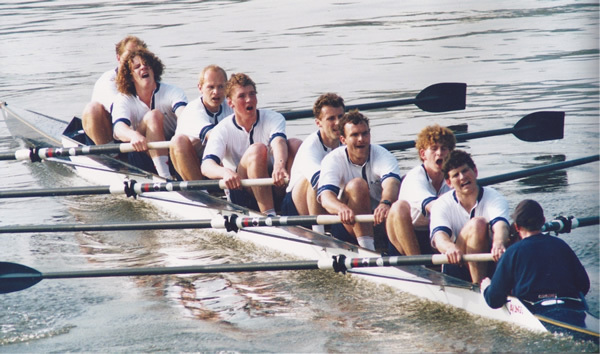 Further information about the Boat Race and the media, and more about Cambridge’s American tour, can be found in Chris Dodd’s The Oxford and Cambridge Boat Race (Stanley Paul, 1983) and Battle of the Blues (PtoM, 2004). Apologies for the unintended Cambridge bias in the photographs.